For those of you that missed it. There's another mahjong title coming to the PS3 and Xbox 360 (although, the 360 version will more than likely be region locked). Mahjong Dream Club... Yep, play mahjong with the hostess girls from the Dream Club series... We'll let the pictures speak for themselves. 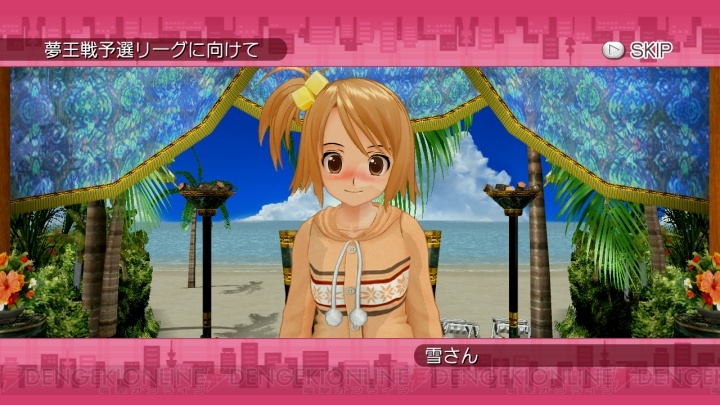 Play-Asia has it listed with a release date of March 29, 2012. So, how many hours will Bart be putting into this one's strategy guide? And, yes... I've already pre-ordered it. Last edited by XFRod on Thu Jan 19, 2012 7:03 pm, edited 1 time in total. Heh! Thanks for the pics and info. I got an email from Play Asia about this today (I get alerts for new releases published by D3) but hadn't had a chance to investigate further. 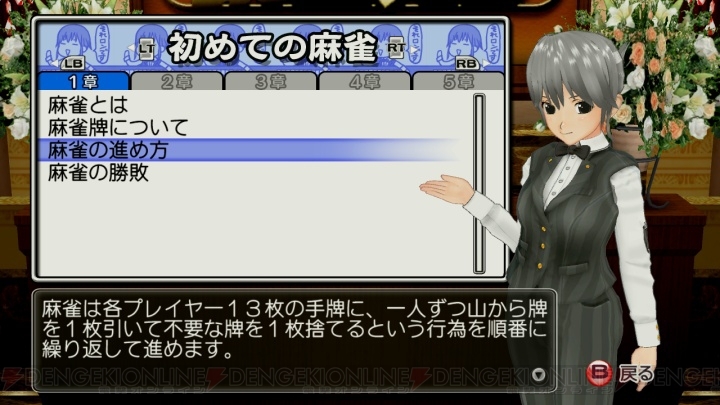 Always good to see a new mahjong title on the PS3 and one with a full table display too. 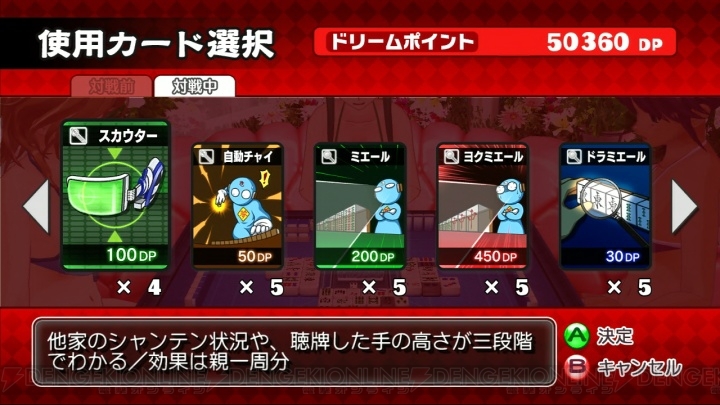 (that's not all that's displayed...) Hope they have some unlockable tile sets - that one looks awful. Wonder if there'll be a top-down view to show the discards more clearly too? I'll have to check eBay pricing on this once it's out. It's looking pretty expensive on PA (especially for a D3 title) and they won't ship Sony software to Europe anyway. Yup. I'm just hoping they spend as much time on the game as they do the outfits. Oh, btw.. Here's a link to a short article about it. It's got about a couple dozen photos including what looks like the menu selection. No screen of game options but, some different views of the table and, stuff to comb over to get a jump on what to expect. There's also going to be some first run, downloadable outfits.. Animal print body suits, different ones for Xbox and PS3 versions. Found these on the website you mentioned however, I had to dig around pretty good for them. NOTE: The different table and tile set in the first pic. XFRod wrote: NOTE: The different table and tile set in the first pic. Good find. Those tiles are much better. From the screenshots it looks like the available modes are Gallery, Tutorial, Competition, Assistance/Cheering (? ), Online, Points Exchange and... I guess the icon with the spanner (or wrench!) is for config settings. Saw an article earlier about the outfit DLC, think it was on Famitsu. According to the Dream Club Blogpost, they're supposed to be releasing a promotional video sometime on Friday. I'll keep an eye out for it and post a link when it goes up online. Also, found an article on Otaku Study that has a run down of the girls, including the VO actresses for them. Perfect Grade A Zettai Ryouiki on Haruka-san. On XFRod's first screenshot, am I missing something, or is the player yakunashi? Referee wrote: I wonder what the Dream Card does. 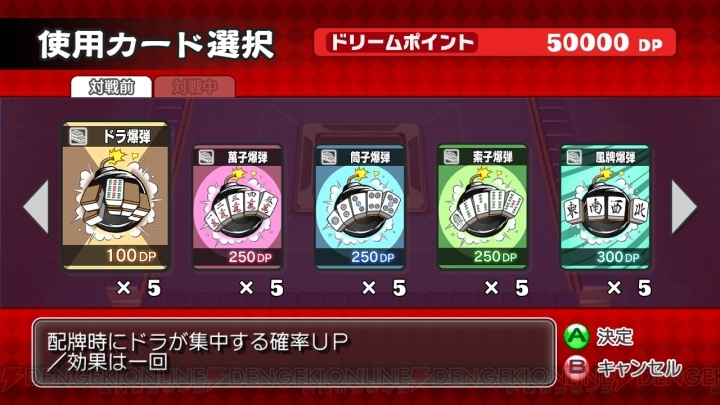 Well, Dream Club titles have always contained in-game, collector's cards for the different girls. They would have stats and information such as, likes and dislikes. These would help you to determine which gifts would be the best to gain the girl's affection. 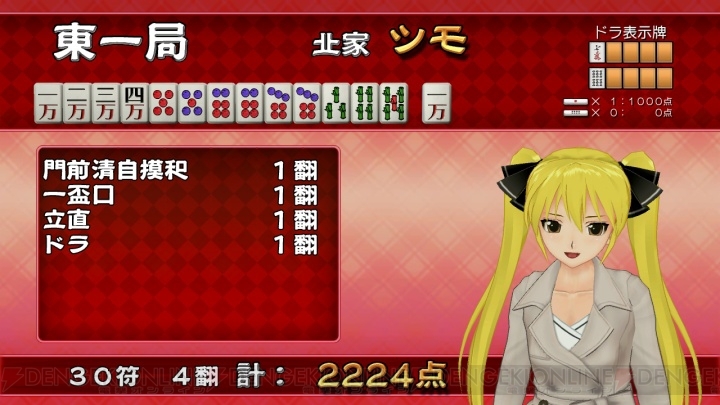 Maybe, the cards in this game also have their mahjong playing style. Such as, "Tries to Pon" or "Avoids honor tiles", etc. etc. The button press could pull up that girl's card so, you could check it during a game? Just a theory. Perhaps this is a kind of "WWYD?" quiz mode. Again, thinking of the Dream Club aspects of the game... Maybe you aren't actually playing in the game during this mode but, "helping" one of the girls... "Oh, no... I don't know which tile to throw... Help me, Rodney-san, you're my only hope..." - Again, just a theory here, no confirmation on this. Portland Mahjong Society - Pwn'ing n00bz since, "2008"
Referee wrote: [...]am I missing something, or is the player yakunashi? XFRod wrote: They would have stats and information such as, likes and dislikes. These would help you to determine which gifts would be the best to gain the girl's affection. If you can exchange won points I guess you can buy/unlock outfits/accessories/gifts. The Amazon listing has a few new screenshots and the fifth one seems to show some sort of cheat function revealing the identity of a wall tile. XFRod wrote: "[...]Help me, Rodney-san, you're my only hope..."
Heh! The icon pic looks kinda like a girl is cheering for the player, or maybe giving orders when he's stuggling. Okay, the promotional video is up on YouTube. Time to scrutinize it and, see if we can find out any new info. Note the pic below, on the left discard pile is a darkened tile. Many mahjong games do this to indicate when a discarded tile is taken from the hand (as apposed to the player tossing their last drawn tile).. I figured that was the case here. However, I noticed that when opponents discard, you can actually see from where in their wall the discard is coming from. I've always hated the darkened tile method and, I think this will be much nicer. Besides, in a real game you have to remember this stuff for yourself anyway. So, upon closer examination, the darkened tiles are just noting a tile that was melded by another player... I really like this. I have several players that I play regularly that ALWAYS organize their tiles the same way. If they discard a tile only two or three tiles from the end of their hand, I can narrow down what they're holding. Looks like I might be able to "take advantage" of these girls. Finally, we had come across a pic that made it look like there was some sort of "cheat" function. It seemed to indicate where a certain tile was on the wall. However, after looking at the video, it's actually just the game highlighting the last discarded tile, making it easier to see what it is without changing the view of the table. The "bubble" with the tile in it, is only on screen for a second and, is gone after the next player draws their tile. So, take a look and, see if you notice anything I missed. That's a good analysis, especially since there's only a few seconds of actual mahjong gameplay footage in the trailer! I've seen other games where tiles that've been called are displayed (shaded) among the discarder's pool. Good to clear up what I thought might be a cheat, although I still hope that there's an alternate view function to see the discards clearly. The title screen at 0'33" includes subsidiary text which mentions that it's four-player mahjong, so there's probably no 3P option. I'm not expecting a huge range of rule settings. D3 clearly had a much smaller budget for hand animations than Sega had for MJ4... still, I guess that's not what people will be buying it for! I wonder what sort of PSN trophies we can expect in this game...?! After more digging around, I found the following stuff on dengeki.com concerning the initial press release of MDC. Lots of pics we haven't talked about here. I'll share some of them (for those of you with just a passing interest in all this) but, here's the link to the pic gallery, if you want to check them all out for yourself. First we have the breakdown of the hand. Nothing surprising here. Pretty standard. A new picture that could show a possible cheating element? My translation skills are amateur, to say the least but, this looks like where you would be spending your Dream Points on cards of some kind? NOTE: The upper left of the cards show two different icons, I'm thinking these are probably categories of cards. With cards like Mirror, Dora Mirror, etc. it's the spyglass icon that has me thinking of cheat options. Not to mention the icons look like the player is seeing through tiles that are facing away from him. Maybe someone with better translation experience can figure something out from the text on the bottom of the screen? Something else to spend your Dream Points on. I've got no clue as to what these are, though. Although, they are under a different category tab than the pic above. Can anyone translate what the different category tags are? A few of these menu screens. However, (again, correct me if I'm wrong) with the header of, "Mahjong for Beginners", "Beginning Mahjong", or something like that... I think it's safe to say these are a series of "how-to-play" screens. Didn't put them here but, some of them go on to show examples of different hands, etc. etc. The skip option on this makes me think, it's probably from the intro video for our, what appears to be, 12 year old hostess girl. Not sure what the question is.. So, if anyone can let me know what it is, I'd appreciate it. Let's hope the game ends up as fun as all this conjecturing about it is. XFRod wrote: Let's hope the game ends up as fun as all this conjecturing about it is. These are definitely cheating techs. That makes it more interesting! The left tab lists cheats used "before play" and the right one says "during play". The five "before" ones are all Bakudan techniques. Bakudan (爆弾) means 'bomb' (hence the icons) but in mahjong it refers to cheating techs where you load tiles into your side of the wall that you can later retrieve during the deal. From left to right along those icons you're loading dora, suit tiles and winds. Normally you need to be the dealer for this to work since you must fix the dice roll as well as load your wall. You load tiles in blocks of four (two stacks), specifically into the 6th and 7th and maybe 14th and 15th stacks (counting from your right). Then you roll a five on the dice - this specifies your side of the wall and the break will be between the 5th and 6th stacks so you collect your loaded tiles during your initial draw. Dora loading is a little different. You still need to throw a five on the dice but now you load dora indicators (e.g. 3 bams) into the 2nd and 3rd stacks and corresponding dora (e.g. 4 bams) in the 6th and 7th. If you manage to load four identical dora tiles in stacks 6 and 7 and two indicators on the top of 2 and 3 (which will become the dead wall's first kan dora indicator and normal dora indicator respectively) then you can declare a concealed kong on your first turn and you instantly have eight dora! Then you can just go out quickly with tanyao, yakuhai or riichi. You can also do these with a dice roll of nine, loading the appropriate stacks. I can't follow sentences with so many kana, but I think she's offering an explanation of something. The options are something like "please" and "no, I'm fine" I think. In one of the other screenshots the same receptionist asks for your nickname and birthdate (day and month) so I guess you can specify the name to use within the game and maybe you get a special event on your birthday or something. Also that seventh option from the main menu (green wrench icon) is indeed "Option/s Mode". The heading just says "reception counter". Can you get around with the romanization? I'm not too sure of the kanji, slow learning process. Also, not sure if I'm breaking the words at the right places, so don't trust the spaces too much. yoroshi kereba [watashi?] de [kanji (a variant of see? )][kanji] nago [kanji, something about speech][bright?] wo sasete itadaku koto mo dekimasu. ikaga [kanji] shimasu ka. I can read kana and translate kanji (most usefully 説明 means 'explanation') but can't parse a sentence with long strings of kana. Counter-intuitively I think it's easier to make sense of sentences with a higher proportion of kanji since you can look them up in a dictionary.